Preheat oven to 350°F. Spray a 11x17 casserole dish with cooking spray. Arrange diced chicken on the bottom of the casserole dish in an even layer. Arrange broccoli florets evenly over the chicken. In a small bowl combine cream of chicken soup, mayonnaise, and lemon juice. Spread evenly on top of broccoli. In a small bowl, combine breadcrumbs and melted butter. Sprinkle over the top of the casserole. Bake for 20-25 minutes or until breadcrumbs are golden. Serve plain or over rice if desired. Note: You can add 1/4 cup grated Parmesan to regular breadcrumbs as a substitution. With crazy weeknight schedules, my window of opportunity to make dinner is really small on some nights. Casseroles are always a good one-dish way to satisfy hungry tummies and slam dunk dinner at the same time. This Casserole on the Quick is a fast and easy dinner that can be thrown together in about five minutes and heated to bubbly perfection in less than thirty minutes. It’s a well rounded meal all in one – chicken, broccoli, and a rich sauce smothered on top. In my house, dinner isn’t considered dinner unless some form of protein is involved. And as a mother, I always try to incorporate a green veggie into dinner to make myself feel like I’ve done my duty of including some nutritional value in the meal. Rotisserie chicken is always my go-to for quick meals. It’s already cooked and has great flavor. For this easy casserole layer diced rotisserie chicken, broccoli florets, and a creamy sauce in a baking dish. Buttery Parmesan bread crumbs are sprinkled on top for the final touch and cooked until golden. Protein … check. Green veggie … check. Warm, comforting, absolute deliciousness … check! 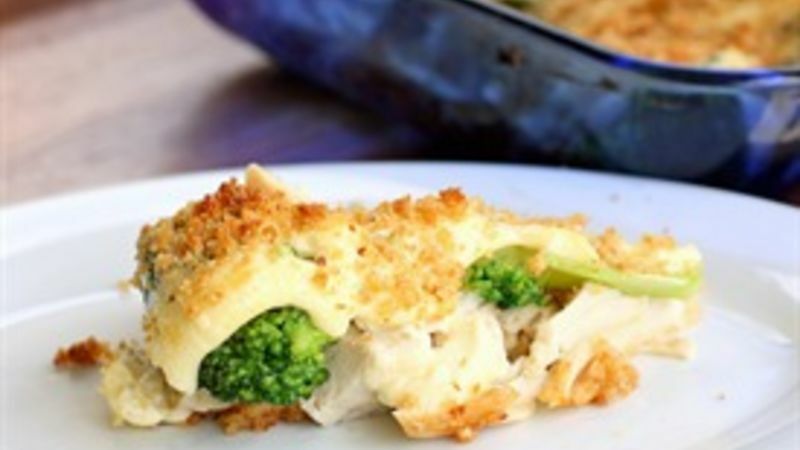 Your family will love this quick and easy meal any night of the week.